During the Eid Al Adha festivities, Copthorne Hotel Kuwait City invites residents and visitors to celebrate this joyous occasion and spend quality time with loved ones and friends. The 4-star city hotel will be your host to a splendid Eid holiday with room rates starting at 45KD per night for single and double occupancy. The package includes a sumptuous breakfast for two adults and two kids below six years at Downtown Restaurant, featuring a rich buffet of mouth-watering cuisines, refreshing beverages and delicious desserts. Stay in one of Copthorne Hotel Kuwait City hotel’s 169 comfortable and spacious guest rooms, furnished with modern amenities to make your stay comfortable and convenient. Each room offers LCD television and complimentary high speed internet access. The hotel is also offering discounts of 50% on food and beverages at Downtown Restaurant during the Eid holidays. 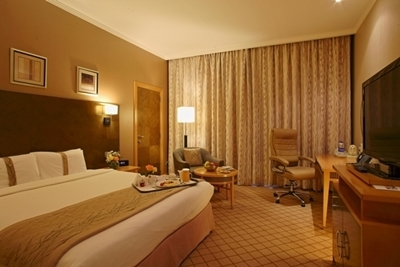 There is plenty to do during your stay at Copthorne Hotel Kuwait City. Guests who will book the Eid Al Adha package will enjoy unlimited and free access to the hotel’s indoor swimming pool where young and adult guests can laze around the pool, sip a refreshing beverage with light refreshments or take a dip in the water to beat the summer heat. Experience the most rejuvenating treatments at the hotel’s health club and spa while the kids can engage in some entertaining pool activities. Copthorne Hotel Kuwait City is the perfect venue to enjoy quality time with family and friends during the long Eid Al Adha holiday.